Every lady needs stylish gothic legwear to go with her favorite gothic blouses and punk rock tops. We offer an assortment of printed leggings, edgy gothic trousers, cool gothic shorts, and stylish leather pants for your closet. 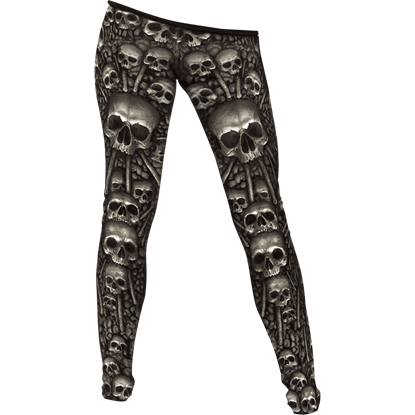 We provide elegant black lace leggings to wear under a gothic dress or ruffled mini skirt, as well as gothic leggings that show off bold designs like skulls, dragons, bones, and more. Our gothic cutout pants and alternative jeans look great with casual womens punk attire, while our selection of studded shorts and ruffled gothic shorts work great for summer gothic fashions. Our black trousers and gothic crop pants provide more stylish ways to incorporate wicked fashion into your outfits every day of the week. For the ladies who cannot get enough lace in their attire, these Black Lace Adorned Womens Pants are a fine way to add a bit more, while bringing a second layer to your attire for reasons of comfort, modesty, or anything else. 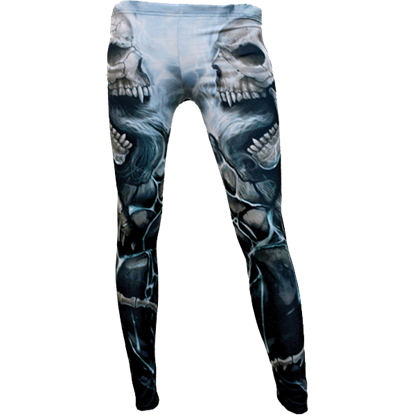 An exemplary item for ensuring your ensemble emanates an aura of gothic styling, the Catacomb Womens Gothic Leggings features an exceptionally detailed design of a catacomb wall which has been constructed with human skulls. Has anyone ever told you that you have a fiery spirit? If so, then you can prove them right and show it to the world, just by wearing this Flaming Spine Leggings. The gothic style is sure to shock and awe all those who see it. Even the heat of the summer months should not keep you front wearing your favorite gothic pieces. The Gothic Black Bloomer Shorts combine incredible gothic fashion with Victorian style in a great choice for staying cool. Part of the fun of wearing shorts and skirts is the opportunity to wear fun leggings and tights underneath! The Gothic Crisscross Lace Leggings show off a detailed design over the length of their black material. Leggings are a versatile part of any gothic girls wardrobe, allowing her to add another layer that brings not only coverage but also style! And that is precisely what these Gothic Full Lace Leggings are perfect at doing! Leggings are a large facet of modern fashion, due to their versatile nature. Add a versatile pair of leggings to your gothic wardrobe with the Gothic Leather Leggings! These pants will go with just about any dark, modern outfit! Leggings like these look great under shorts and skirts, adding detail and interest to the look of your legs. The Gothic Pseudo-Garter Lace Leggings show off an intricate front design of lace stockings held up by garters. Do you want to keep wearing your favorite gothic fashions even during the hottest parts of the summer? The Gothic Striped Bloomer Shorts make it possible to stay cool and fashionable any time of the year. When you want to make sure no part of your outfit fails to draw envious glances, consider this pair of black shorts. The Gothic Studded Thigh Belt Shorts feature a number of details that set them apart from ordinary fashion. For casual comfort in nearly all situations, a girl will want to own a pair of Ladys Bootcut Goth-Punk Pants. They are cut in a classic style, while still featuring touches of style that make them a stellar addition to any girls closet. If you are looking for legwear of a different stripe, look no further than the Vertical Striped Leggings. These costume leggings feature fun black and white stripes that run up and down their length for trendy, statement-making style.